Pizza potatoes with chili are a wonderful vegan treat and a lower calorie pizza alternative for people with an allergy to wheat or who don't want to have a bread crust, or who have extra chili and wondered what they could do with it. 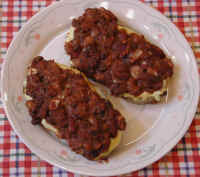 Pizza potatoes with chili can be baked in either a microwave oven or in preheated conventional oven at 350 degrees F.
Hold a potato on its side and carefully slice the potato lengthwise into three equal width slices. Place each slice (12 total for the 4 potatoes used) on a large non-stick baking sheet and bake in the oven for about 40 minutes until the inner portions of the potatoes are soft and the cut surfaces are beginning to brown. While the potato slices are cooking, open the can of beans and pour off the liquid. Place the beans in the container of your blender, add the lemon juice, nutritional yeast, and corn starch, and run the blender at high speed until the contents are creamy smooth. If the chili is not thick, it can be thickened with 1 tbsp. corn starch thoroughly mixed in and heated until the chili thickens. When the potatoes are baked, remove the pan from the oven and set on a wire rack. The chili and the bean cream should also be ready. 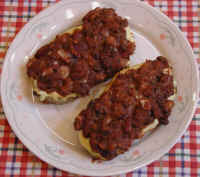 As quickly as possible, spread a layer of the bean cream on each potato slice. Carefully spoon on the chili. Place back in the oven until the toppings are hot. When the pizza potatoes with chili are baked, remove the pan from the oven, and set on a wire rack. When the pizza potatoes have partially cooled, they can be picked up and eaten as "finger food."